Iraqi men grieve at the scene of a deadly suicide car bomb at a commercial area in Karrada, Baghdad, July 4, 2016. The death toll from Sunday's suicide truck bombing in the Iraqi capitol of Baghdad continues to rise as more bodies are recovered from the rubble. Iraqi officials said Monday at least 151 have died in one of the deadliest attacks in Baghdad since the American invasion of 2003. At least 200 people were injured and officials say that number may continue to grow as rescuers dig through ash and rubble using shovels and their hands. Iraqi Prime Minister Haider al-Abadi ordered tighter security measures in Baghdad, but on the streets some Iraqis expressed anger over the government's inability to keep residents safe. 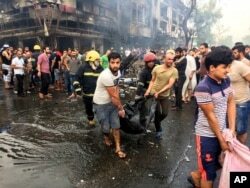 The U.S. Department of State condemned the attack, noting the blast was timed to coincide with crowds flooding the Karrada markets as Muslims broke their daily Ramadan fast. "We will continue to unite the world against this evil, remove their safe havens, and uproot their global networks," the statement read. The Islamic State group claimed responsibility for the truck bombing, saying it targeted Shi'ites. The mainly Sunni militants consider Shi'ites heretics. Iraqi firefighters and civilians carry bodies of victims killed in a car bomb at a commercial area in Karrada, Baghdad, July 3, 2016. U.N. Secretary-General Ban Ki-moon said he is "appalled by the utter disregard for human life" shown by those responsible for the bombing. U.S. National Security Council spokesman Ned Price said Sunday the United States remains united with Iraq in their combined efforts to destroy Islamic State. Last week, the U.S. envoy to the coalition against Islamic State said he believes the coalition is moving at a tempo that will lead to the ultimate defeat of IS. Brett McGurk told the Senate Foreign Relations Committee that IS territory has shrunk by almost 50 percent in the last 18 months. But CIA Director John Brennan said a week earlier that Islamic State has no intention of slowing fading away, and instead it has been shifting its focus to ensure it remains the world's top terror organization. The militants swept through large areas of northern and western Iraq two years ago. Iraq forces fighting on the ground and a U.S.-led coalition of airstrikes have reclaimed territory, including Fallujah last month, but Islamic State still controls several large cities such as Mosul. National Security Correspondent Jeff Seldin and State Department Correspondent Nike Ching contributed to this report.